Breaking News: Nigerian Girl Raped By Her Teacher And Impregnated 3 Times By Her Sister's Husband! Nigerian Girl Raped By Her Teacher And Impregnated 3 Times By Her Sister's Husband! A Nigerian girl said to be an orphan identified as Basirat has been reportedly handed over to the Lagos state Government, after she was repeatedly sexually abused by her sister's husband, and School Teacher. 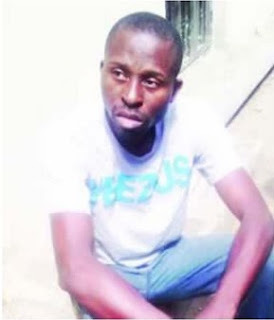 According to report, Basira who started living with her sister in the Ajah area of Lagos State, after her parents died in 2014 while she was 15 years, was deflowered by her 34 years old school teacher identified as Folorunsho Joseph after he got her drugged. While her sister’s 37-year-old husband named Mukaila Bello, who decided to take advantage of the incident started defiling her repeatedly until she became pregnant 3 times. It was learnt that Bello, who is an indigene of Kwara State, that has four children and works with a charity organisation on Victoria Island in Lagos, after forcing Basirat to have an abortion in at a chemist continued having s*x with her until she became pregnant the second time. .
After which he allegedly took her to an hospital in the Orile area of the state where another abortion was done for her. After the abortion, Basirat reportedly confided in her grandparent, who relocated her to the Ijebu Ode in Ogun State to live with some other in-laws. But Bello allegedly visited and defiled her again at the new place, and this resulted in a third pregnancy. And after he allegedly made her carry out another abortion for the third time, Basira's family members subsequently petitioned the Lagos State Office of the Public Defender who took her to the Mirabel Centre, in Lagos State University Teaching Hospital, Ikeja, where medical tests results that were carried out confirmed that she was defiled. . According to the daughter of the man with whom Basirat lived with in Ijebu Ode, Kaosara, Bello was known to her family as Basirat’s boyfriend. After the officials of the OPD reported the case at the Area J Police Command, Elemoro, the suspect was immediately arrested, with the teacher that first raped her in 2014 and one of those that conducted the abortions for her. While confirming the report, the state Police Public Relations Officer, SP Chike Oti, disclosed that all the suspects have been arraigned in court.